When civilians get their vehicles stuck in mud pits, they’ve got to find someone with a truck (or tractor) and tow strap to give them a tug. But when Air Force airmen get their rigs stuck, they’ve got much cooler options. Writer for the Billings Gazette Jordon Niedermeier was out turkey hunting in Montana with the newspaper’s outdoors editor when the two came across a HMMWV stuck on the muddy road. After his editor took some photos (including the one above), Niedermeier did a bit of digging, and found that the HMMWV belonged to U.S. Air Force security forces out of Malmstrom Air Force Base, and that it had gotten stuck while its crew patrolled nearby Minuteman III missile sites . The Billings Gazette spoke with public affairs chief at Malmstrom Air Force Base Connie Hempel, who said that, upon getting stuck, crew members patrolling the missile sites had to ditch the HMMWV in the mud and walk down the road carrying weapons and other military gear. 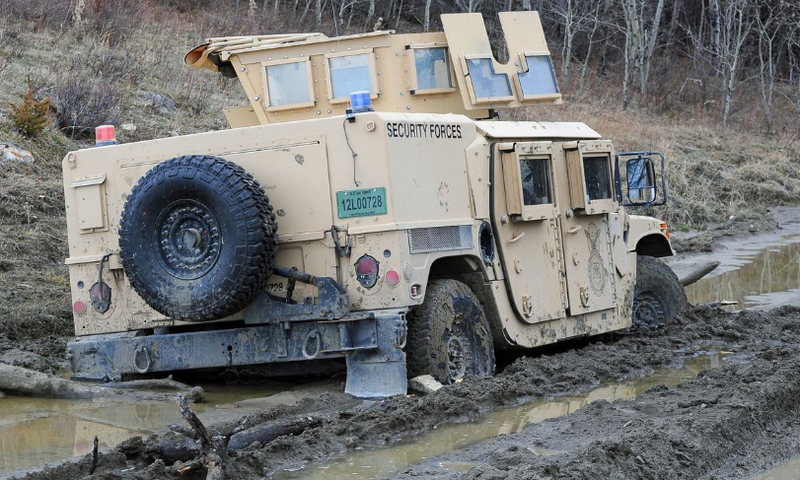 With mud all the way up to the driver’s side door, the Humvee—which rides on enormous 37-inch tires and whose belly sits well over a foot above the ground—wouldn’t budge even after multiple attempts to jam rocks and branches under the tires, and to tow the vehicle out with a truck. Major Lende said the entire training operation only took 30 minutes, at which point the HMMWV (the “sling load”) was back, safe and sound, on Malmstrom Air Force Base after being stuck in the mud pit for over a week. Boy would it be nice if we civilian off-road enthusiasts had access to such machinery—it would make our mud-pit extraction operations a heck of a lot more interesting.